At times parties entered in international sale contracts are unaware of the different trading practices in their respective countries. This can give risk to misunderstandings, disputes and litigation, with all the waste of time and money that this entails. In order to remedy these problems, the International Chamber of Commerce (ICC) first published in 1936 a set of international rules for the interpretation of trade terms. These rules are known as INCOTERMS(c). 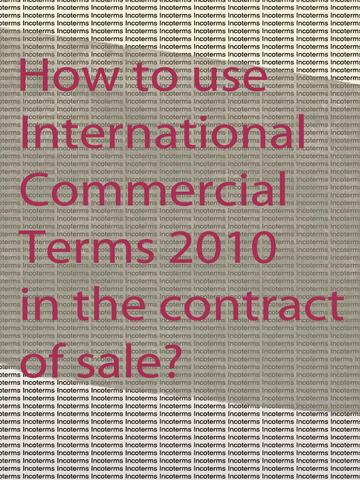 The word is an abbreviation of International commercial terms and the chosen Incoterm is a term of the contract of sale (please note: not of the contract of carriage). Since then these rules several times have been amended in order to bring them in line with international trade development and global market changes. In recent years, Incoterms have been revised at 10-year intervals (Incoterms 1980, 1990, 2000, 2010). From first January 2011 new version of the rules “Incoterms-2010(c)”(ICC Publication № 715 E) came into force, which consists of 11 following terms - EXW, CPT, CIP, DAT, DAP, DDP, FCA, FAS, FOB, CFR, CIF. To avoid confusion and difficulties in applying Incoterms a reference to the current version should always be made in the contract of sale. Presently when parties negotiate their contract individually, they should take care not only to refer to Incoterms but also to add the year 2010. If they use a standard contract, they should check whether it has been updated to include reference to “Incoterms 2010(c)”. If not, the previous year should be replaced by the year 2010. It is very important to understand that all details of sale/purchase transaction for each chosen term are not included in Incoterms. Therefore the needed details to be listed in sale contracts. The recommendations of what should be included in the contracts are attached. Furthermore, Dictionary of Abbreviations and Glossary of generally used terms are included for convenience of the user. A scheme that show the costs and obligations for the buyer and the seller for each term is also included. Current version of App is optimised for all devices, including iPhone 4 and iPad.